With so much local apple picking to be had, it seems only natural to share an apple recipe today! This homemade applesauce is so quick and easy that even my kids can make it without much assistance from me. We like to use a mixture of sweet and tart apples, such as MacIntosh and Golden Delicious. Enjoy. Mix all the ingredients together in a pot over medium heat. Cover and cook about 15-20 minutes, stirring occasionally. Remove from pot and let cool slightly. For a chunky applesauce, leave it as is or mash it roughly with a fork. For a smoother sauce, blend it as desired in a food processor. 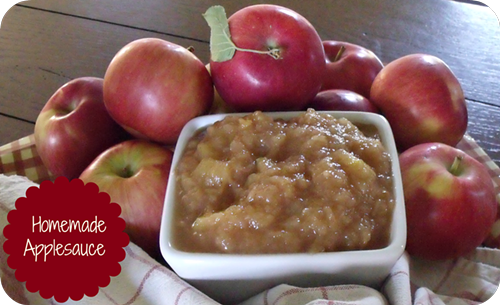 Enjoy the applesauce warm off the stove, or refrigerate it to eat later!